Hot Dog season kicks off Monday, with Americans consuming 7 billion between Memorial Day and Labor Day, or about 818 hotdogs per second. The Internet loves “Top Ten Lists” and I love hotdogs, so this was bound to happen. Lucky for you my hands-on, definitive, undeniable list of the ‘Top 10 Hotdogs in America’ is now available and free for you, just in time for Memorial Day Weekend. Not many hotdog stands have been recognized as a National Historic Landmark, but “it wouldn’t be summer without a Walter’s.” Founded in 1919, this pagoda on the side on the road has long lines for delicious dogs slathered in a house-made mustard. I once waited in line for an hour for a hot dog at Pink’s on La Brea Blvd. And people who know me, realized I don’t wait more than 10 minutes for anything. In a city with more than 1,000 restaurants, including Spago and Nobu, Pink’s ranks #10 on Trip Advisor in L.A. I once saw a drunk John Cusack chowing down on a dog there at 2 a.m.. 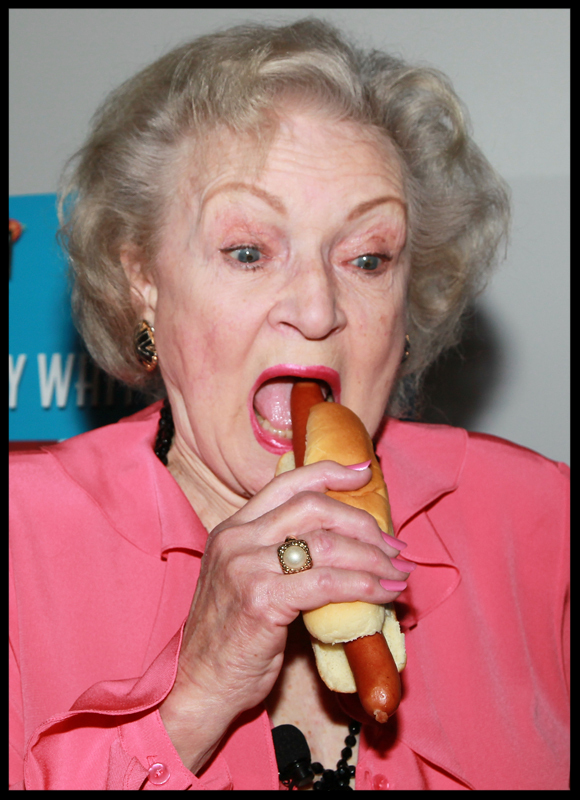 Apparently, Betty White is a big fan too. One of the best chili/slaw dogs I’ve ever had was at this little side of the road place in Henderson, and it was one of the best values too. $1.79 will get you one the best in USA. Try it if you’re near Asheville or west of Charlotte. It’s worth the drive. From anywhere. Nice folks too. I was never a fan of the Chicago-style hot dog, until I tried Wolfy’s on a visit of the Windy City. During several visits to the French Quarter, I have devoured several amazing hot dogs at Dat Dog. My memory is hazy, but the pictures I took suggested that I really, really enjoyed them. Even the very picky people on Yelp like them, and that’s saying something. Sam’s Hot Dog Stand is near the top of my list, and my go-to here in RVA. Super nice folks, and you get an amaaazing slaw dog with spicy chili there. Yes, it’s chain and I don’t like chains, but I’ll make an exception here. Since 1935, the tiny Texas Inn has served “150 people, 15 at a time.” Better known, perhaps, for their bowls of chili and their signature Western Sandwich, the “T Room” serves a world-class hotdog with a yellow, Virginia-style relish that is frequently copied, but it’s never as good as the original. The best part might be the price: Food & Wine voted it one of America’s Best Food Values. So here we are, #1. Ta-da! The BEST hotdog in America in my not-so-humble-opinion comes from Moore’s Country Store, on US Rt. 460 in the tiny hamlet of Mt. Athos, Virginia. This old school country store has an old oak tree growing through the roof and its parking lot is full — morning, noon and night — with people who buys Moore’s Famous Chili Dogs by the bagful. On Monday, after a busy day, I managed to meet up with friend, Rotarian and fellow church council member Ben Handzel for a couple of Buds at The Great American Ranch, a new country-themed place near Woodlake. Ben started his business Restoration 1 last year, and we talked about ways to get more clients. One idea I had was giving him a shout out in the Weekly Report. Ben and his team did an AMAZING job for us when Graphic Designer Erin Rebmann clogged the drain with spoiled milk last year. If you have water (or milk) damage, call Ben at 804-293-1832. Here’s another way to help Ben get his new biz off the ground…having YOU go “like” his Facebook page. On Tuesday morning, at the magnificent Midlothian Rotary Club meeting, we were reminded the reason we celebrate Memorial Day, when we heard from Paul Levengood VP of Development for the Virginia War Memorial Foundation. Paul delivered a great talk, and I was delighted to find out he is a fellow Rotarian. You can honor those who served this weekend by running in their “They Gave All” 5K Race. Wednesday, May 23 – Welcome! On Wednesday we welcomed a new client! I’m thrilled to announce that Southern Goodman has just signed Madison+Main as it’s Agency of Record. 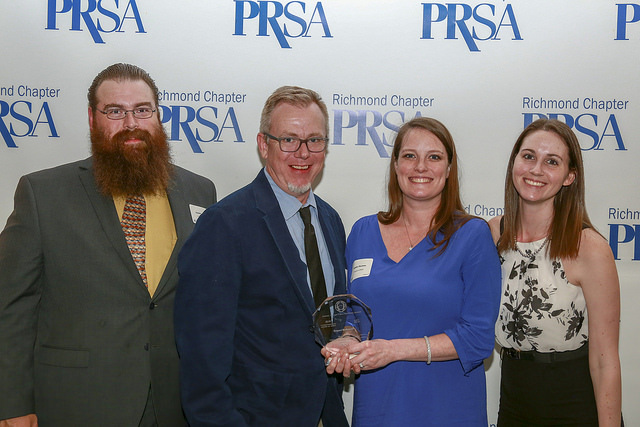 We can’t wait to work with this friendly folks at this fast-growing Powhatan-based company. We see perfect weather in your indoor forecast! Kent, Art, Kaitlin & Erin are BIG winners in my book! Saturday, May 26 | 12 – 8 p.m.
Join me at CrossKeys Vineyards this Memorial Day weekend as they celebrate their 10th anniversary with award-winning wines, exquisite food, and great events! Chow down on Smoked & Oaked Barbecue tomorrow with live music from Morgan Dean. Make your reservations today. I’m skee-daddling early just like you, but before I go….I hope you have a GREAT, SAFE and RELAXING Memorial Day Weekend.